« Mr. Ding-A-Ling Dings Me. This video in this post will soon be everywhere, as it’s going viral. But I can’t resist. The G-20 summit was in Toronto over the weekend. Some people who objected to the whole shebang rioted. 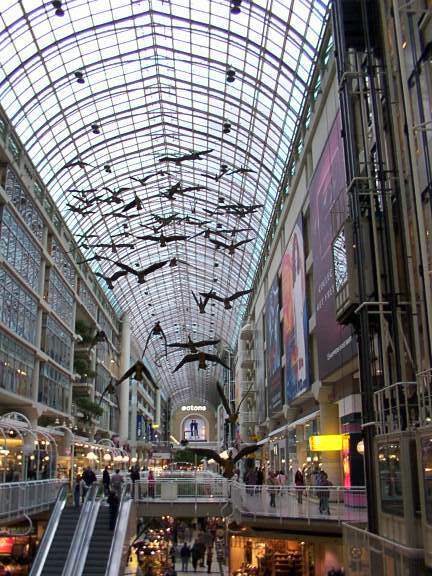 That, in turn, prompted the Toronto Eaton Centre mall in Toronto to go into lockdown. Apparently, the mall operators have an aversion to smashed windows and Molotov Cocktails. As always, this whole episode raised questions for me. I always have questions. Our fearless shopper’s attitude suggests that shopping is a basic human right, that we must be free to do it at any time. I completely missed this. When did the world human rights commission, or whoever controls that type of thing, decide this? The secondary question is: I’m not an enthusiastic shopper. I usually prefer to do other things. Does my lack of enthusiasm mean I’m taking away the human rights of people who do like to visit malls, because I’m such a killjoy? What was our shopper intending to buy, anyway? It looks like it was terribly important. Not to be mean, but he does not appear to be the Abercrombrie & Fitch type of person. He was certainly cranky. Maybe he hadn’t had enough sleep. Maybe those damn G-20 rioters kept him up the night before. Maybe he wanted to buy earplugs. Did the Toronto Eaton Centre pre-empt a sale on ear plugs during the shutdown? I think our hero has hit upon a new protest slogan that fits this day and age perfectly. “We are the public! We want to shop!!! !” Although I could tell he was disturbed the rest of the public did not seem to take the desire to shop seriously enough. “Doesn’t anyone else care?” he demands. Well, uh, no, not really. This entry was posted on June 29, 2010 at 2:55 pm and is filed under Uncategorized. You can follow any responses to this entry through the RSS 2.0 feed. You can leave a response, or trackback from your own site.